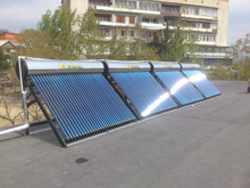 The project envisages the introduction of solar thermal system for hot water supply and implementation of energy saving measures such as weatherization of attics, replacement of old wood windows & doors with double glazed ones in PVC frames and replacement of incandescent light bulbs with energy saving ones. The introduction of solar thermal system for residential buildings with total capacity 2800 litres and 400 litres capacity for the kitchen will decrease the consumption and dependence on grid electricity. In addition to improving observation of sanitary norms for baby care (158 infants) and their living conditions the implementation of the above measures will result in reduction of electricity and gas consumption by the Baby House, reduction of energy bills and in significant CO2 emission reductions. a) After development of detailed work plan for the implementation of the sub-project and obtaining necessary information the technical expertise of the planned works including energy audit of the buildings was performed. The aim of energy audit is to analyze current energy consumption and estimate ENCON (Energy Conservation) potential in the buildings. During the energy audit both such measures as: roof insulation, introduction of solar thermal hot water supply system, replacement of convectional light bulbs with CFLs which are currently under the implementation as well as measures like: insulation of floors and walls have been estimated. The current annual energy consumption of the Baby House buildings for heating, hot water supply and lighting and various appliances is-751376 kWh, including 447094 kWh for Building A and 304282 kWh for Building B. 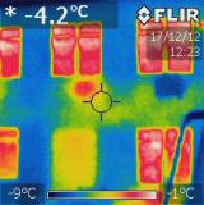 Below the ordinary photos of the one of the buildings and corresponding thermal photos illustrating the heat losses (white, yellow and red colors show heat escaping, red - greatest heat loss) from building elements are shown. Buiding-A - 3000 liter active solar combi system for water and space heating which will be integrated with the existing gas boiler and will contribute to the hot water supply and space heating. Building-B - 1270 liter passive solar water heating system which will be integrated with the existing storage tanks and gas boiler and will contribute to the hot water supply. In case of the excessive energy generation it may also contribute to the space heating. 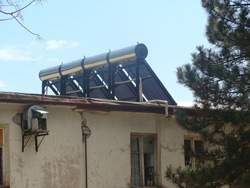 Kitchen Building - 270 liter passive solar water heating system for hot water supply of the kitchen. Building A. Insulation of slope roof with will be arranged with 10 cm thick mineral wool with the utilization of the anti-condensation and diffusion membrane. Mineral wool utilized will meet the requirements for thermal conductivity 0,045 W/m0K as specified in the Energy Audit. Building B. Insulation and waterproofing of the reinforced flat roof will be constructed with the utilization of 5 cm thick XPS (extruded polystyrol ) boards and linocrom. Izocam foam boards with thickness 50 mm and thermal conductivity 0,035 W/m0K as specified in the Energy Audit. After considering several options for replacement of windows such as type of glazing (double or triple) or low emitting glass, their technical characteristics and prices the decision was made in favor of low emission double glazed windows to replace the existing old windows. 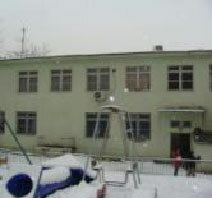 The total area of replaced windows and do ors in both buildings is 213,6 m2 and 66,4 m2 respectively. e) Replacement of incandescent light bulbs with CFLs and LED lighting system. As envisaged by the project proposal in order to decrease electricity consumption the incandescent light bulbs installed in the both buildings of the Tbilisi Baby house were replaced by energy saving light bulbs. In total 100 incandescent light bulbs were replaced by OSRAM 18W CFLs and 60 incandescent light bulbs were installed in the places with many hours of usage during the day were replaced with 10.5 W LED light bulbs. As estimated during the energy audit such measure will result in annual electricity consumption savings of almost 26530 kWh. All the works for the installation of solar thermal systems and their testing were completed by the end of May, 2013. 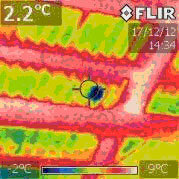 After the installation of thermal meter and controller, the testing of the solar system started. The checklist for registration and calculation of ongoing outflow of electricity in order to compare electricity and natural gas consumption after implementation of the energy efficiency measures and installation of solar thermal systems was prepared. The metering data will be collected on a monthly basis. As by mid-March works on the replacement of bulbs, insulation of roofs and replacement of old windows and doors were completed and beginning from end of March the monitoring of the electricity and natural gas consumption was started. Below in the table the gathered data for electricity and natural gas consumption and comparative analysis regarding the same period of the previous year is given. Total electricity savings for the period - 15,219.6 kWh which is about 35%. Total natural gas saving for period - 14,572.7m3 which is about 51%. Energy bill savings for the period - 13,364.9 GEL. Emissions reduced - 33778.9 kg CO2 in the period. Special information stand was prepared and installed at the entrance of the Tbilisi Baby House. The stand contains information about project donor and implementing organization as well as brief description of implemented energy efficient measures and achievable savings in energy consumption and environmental benefits. Posters describing implemented energy efficiency measures were developed, printed and fixed on the hall walls. All the works including arranging of roof insulation, replacement of windows and doors, replacement of incandescent light bulbs are videotaped and photos were taken. 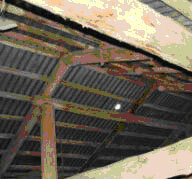 This material was edited and short video describing all the works prepared. The project launch event and presentation of the implemented energy efficiency measures was organized on June 5, 2013 as a part of events to celebrate the World Environment Day. 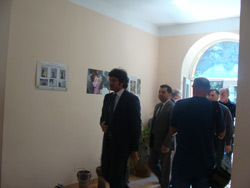 The event was attended by the representatives of BP in Georgia, Minister of Environment and Natural Resources Protection, Minister of Labor, Health, and Social Affairs, Minister of Energy, officials from state social care organizations, representatives of environmental organizations, Tbilisi Baby House personnel, EEC Georgia team& media. The audience was welcomed by the Tbilisi Baby House Director Mr. David Papiashvili who congratulated the audience with the World Environment day, talked about the benefits the project brought to the Baby House in terms of saved energy and improved comfort for the infants and the personnel, thanked the project donor and the implementing organization. 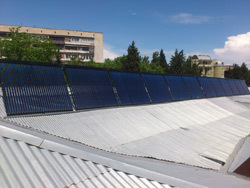 EEC Georgia Director, G. Abulashvili spoke of the project as the example where the energy, environmental and social issues are linked together resulting in energy and bill savings, reduction emissions to the atmosphere and improvement of living conditions for the Baby House inhabitants. Then Mr. Abulashvili told about the technical details of the project, describing each energy efficient measure introduced and expected results. BP Georgia representative, Mr. Gia Gvaladze, External Affairs Manager greeted the audience and told that BP for years is implementing projects in social sphere and energy efficiency is one of the priority areas. He thanked EEC Georgia for a 5 year fruitful cooperation in implementation of energy efficiency projects and pointed out that successful implementation of this project will be a good example to follow by other private companies operating in Georgia. Minister of Environment and Natural Resources, Mrs. K.Gogaladze spoke about the role of energy efficiency in decrease of energy consumption, improvement of environmental situation and energy security of the country. She also pointed out that this project and achieved results will give an impetus to other companies to implement similar projects. Minister of Energy, Mr. K.Kaladze spoke of the importance of implementation of the energy efficient projects on a wider scale, told about the ministry’s efforts on drafting energy efficiency law. He also spoke about the importance of public awareness campaigns on various energy efficient measures like: energy saving lighting systems & home appliances and other clean energy applications. Minister of Labor, Health, and Social Affairs, Mr. Sergienko spoke of the importance of the project, its energy, environmental and social benefits. He stressed out also economic results of the project for the Baby House as possibility for the institution to use money saved on energy for other necessary needs. The invited guests toured the Baby House buildings and yard in groups to see the installed equipment. The launch event was covered in the news by the invited media- Rustavi-2 and TV-9.